My visit to Pender didn’t last long, but it was heavenly to enjoy the sun, water, beaches, friends and food at the Bluewater Cruising Association rendezvous at Poet’s Cove. … and the dog, of course! I don’t have any grandchildren, but I sure do enjoy hanging out with my grad puppy Spartacus (Sparty). He’s becoming such a confident little boat dog! My visit ended with a great potluck! The dinghy rode a bit lower in the water when the time came to shuttle me back to land to catch my taxi down to the other Pender Island (there are two – north and south). I took lots of photos so I have more than enough reference material to get back to work drawing various things once I get back home. I even managed to find a bit of time to work on my lines for Romeo and Juliet while hanging gout in the cockpit. I also managed to find a bit of time to do a blind contour drawing of the Dragon Fountain from Butchart Gardens. The idea is to not look down at your drawing but to choose a line in the object and follow it without ever lifting pencil from paper. About to board the ferry now and head back to Victoria for another couple of days before hopping back on another flight to Calgary. After leaving the hospital for what has become our daily morning visit to ER to deal with ongoing nosebleed management issues, Dad and I headed for Butchart Gardens to gather some raw material for drawing and painting. It has been YEARS since I was last at the gardens and I have to say, they really are quite something, especially given the place is also a story of reclamation and rehabilitation. Once an ugly quarry that supplied limestone for Robert Butchart’s cement plant, the gardens were the dreamchild of Butchart’s wife, Jennie who wanted to pretty things up a bit once industry was done with stripping what it needed from the land. What a beautification project! These days, almost a million visitors a year stroll around the gardens, snapping photos. As one would expect, there are gazillions of flowers, shrubs, and trees, but there are also fountains, statues, and a carousel. I have always loved carousels and am always a bit disappointed when I’m near one without a child to coerce into riding with me! A carousel horse statue prances near the carousel, an escapee from the endless drudgery of up and down and round and round. I took several photos, thinking I might be able to draw it later. Dad gave me a brush pen with a reservoir for use with watercolours and once I got home I pulled out the watercolour pencils I brought with me and started to experiment. Unhappy with the pole, which looks awful, but I’m thinking that if I mess around with that it will get much worse… As it is, you can tell it’s a carousel pony, so I’m happy to leave it at that! I could answer something along the lines of how you are never fully alive until you look down between your feet to see… nothing. Or, how standing on top of a mountain makes you feel simultaneously invincible and insignificant. 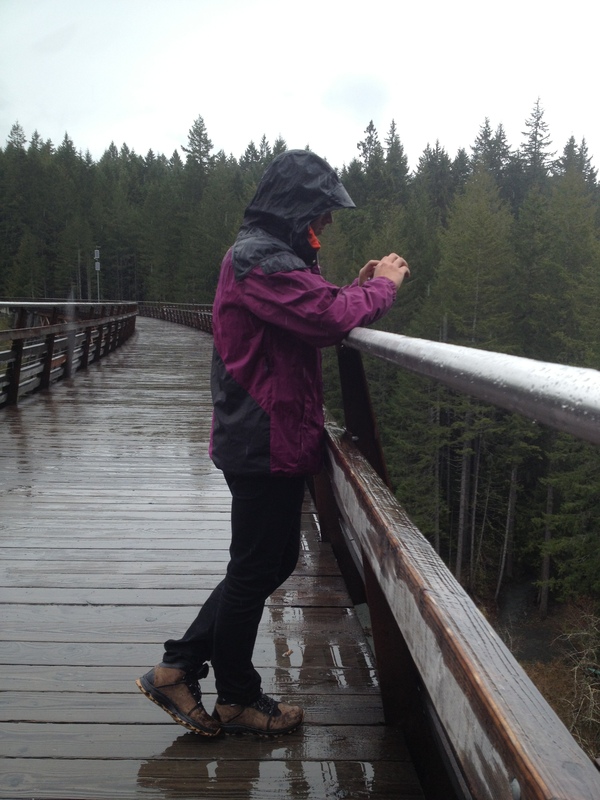 Or, how there is simply no better way to spend a day than by being outside… But I won’t. What I discovered recently is that there is a very practical and sensible reason to be happy in high places. Raring to go up the mast! A few weeks ago we were out on my daughter and son-in-law’s sailboat. We tacked just as a big gust caught us and handily fouled the foresail. In the aftermath (which involved a lot of flapping lines and waving arms and scrambling around to get the sail back where it was meant to be) we managed to send a spreader boot flying off the end of the spreader and into Finlayson Arm where it sank in hundreds of feet of icy cold water. Not a sharp photo – sorry about that. But you can see the state of the old spreader boot (the one that didn’t fly off into the water). It was disintegrating and held on only by a single ancient cable tie. That cable tie popped off when I touched it, so it was a good thing we replaced both while I was up there. After procuring new pair, I was delighted to be sent up the mast to install the shiny new spreader boots. Securely fastened with rigger’s tape, they will help provide a smooth non-snagging surface for wayward halyards. See? Slipping into a climbing harness and heading up, up, up is about the most fun a climber can have on a boat! 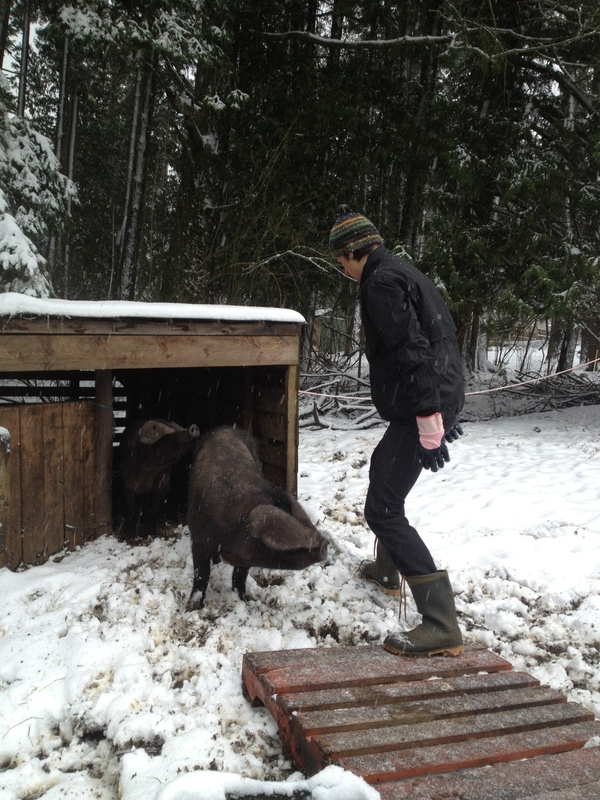 Funny how sometimes it takes having a visitor to get you out and about and exploring the neighbourhood! That’s exactly what has been happening since we started hosting our lovely volunteers – we’ve been tootling around southern Vancouver Island, showing them the sights and falling in love with our amazing home all over again. 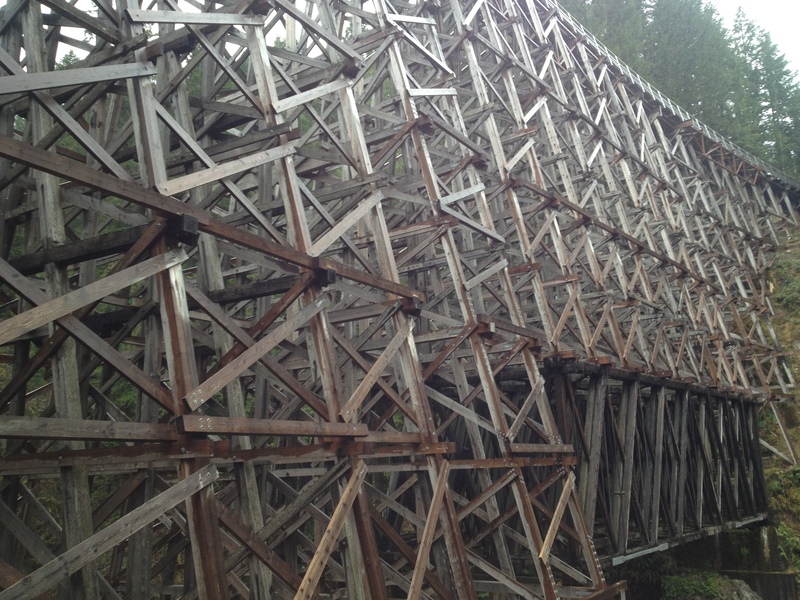 The Kinsol Trestle on Vancouver Island is the largest remaining wooden trestle in the Commonwealth – the recently rebuilt and refurbished structure contains 60 percent of the timbers from the original completed in 1920. 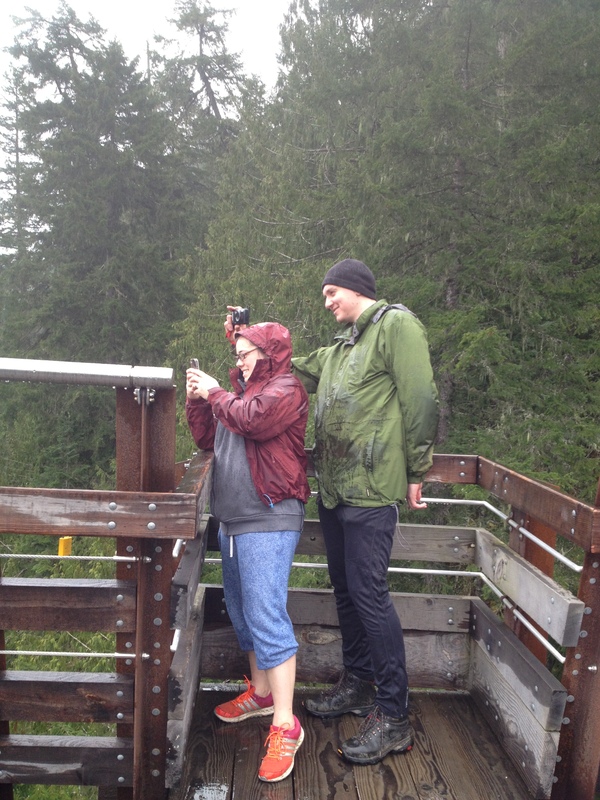 Everyone was a little soggy, but the rain softened as the afternoon wore on and despite the weather we all enjoyed our outing. 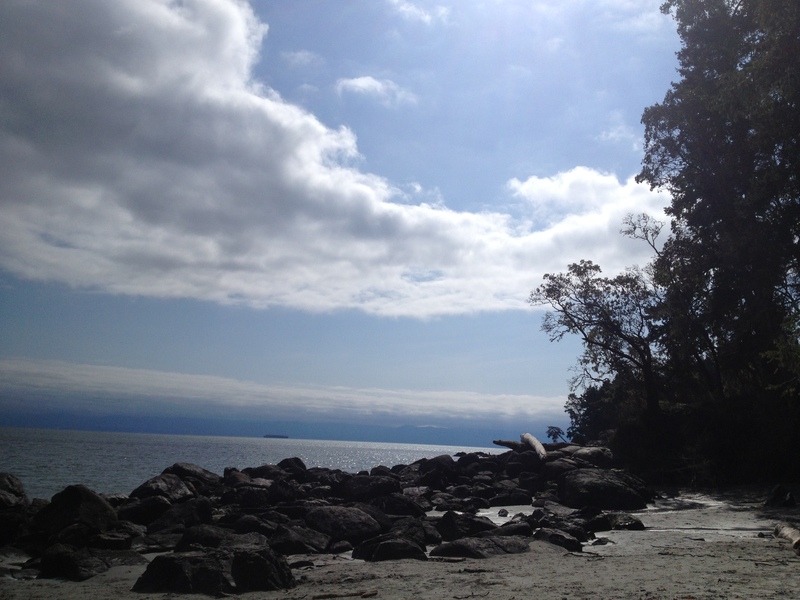 A couple of weeks ago we all trekked out to East Sooke Park, another glorious destination not so far from here. It would have been hard to have picked a nicer day! The sun came out and between the hiking, the dogs romping, and the tasty picnic, we all came home happy and relaxed. 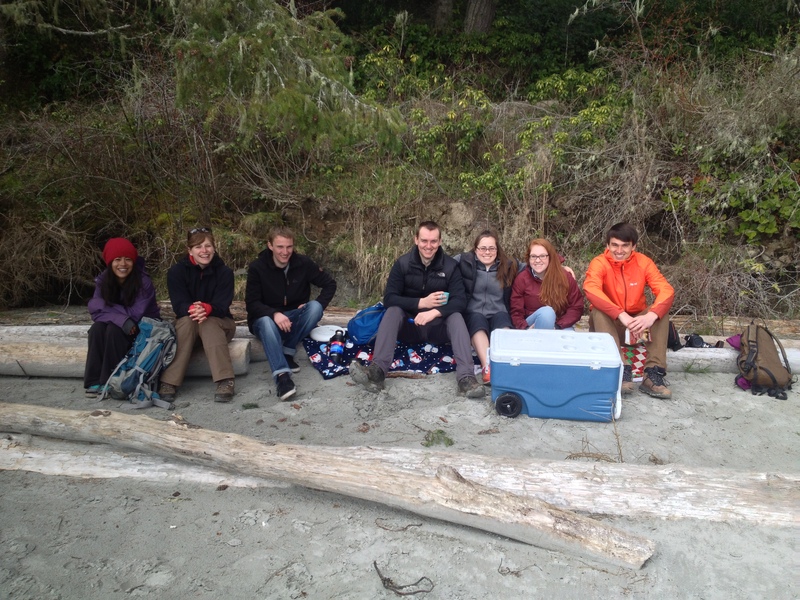 Volunteers from our place and from Maypenny Farm enjoying a day at the beach at East Sooke Park. 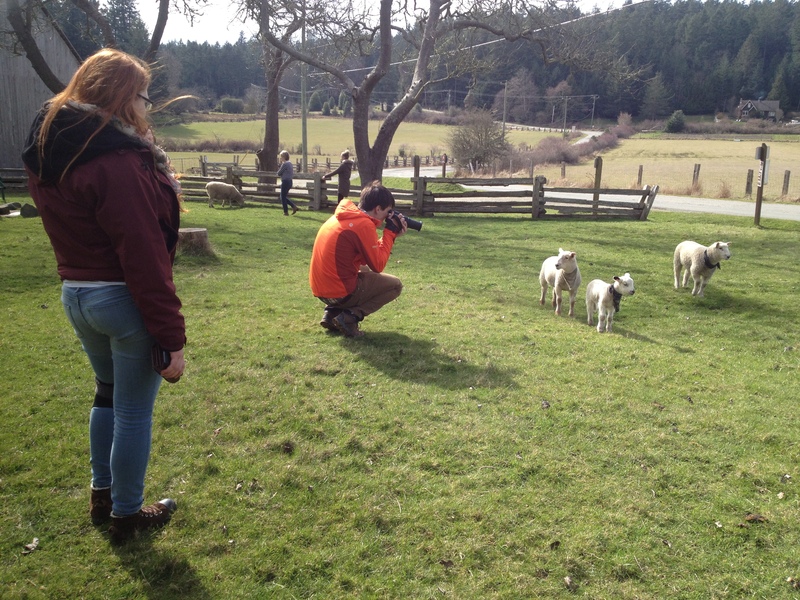 Even when we are ostensibly ‘working’ we try to throw in a bit of fun… When I had to take a load of ducks to Salt Spring Island for processing (the nearest facility that will take ducks at the moment) we allowed a bit of extra time for sightseeing. No visit to SSI is complete without a trip up Mount Maxwell, a visit to Ruckle Park, something to eat in Ganges, and a round of frisbee golf. 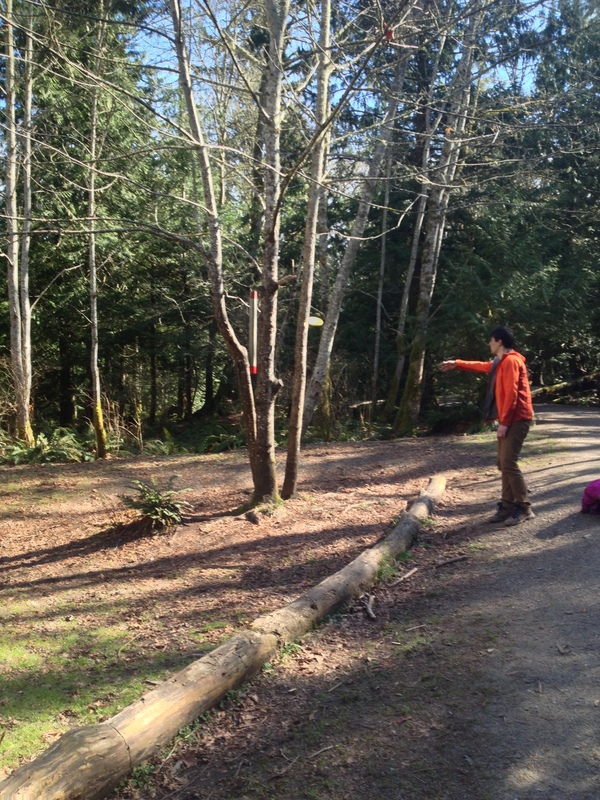 Frisbee golf is a lot harder than it looks. 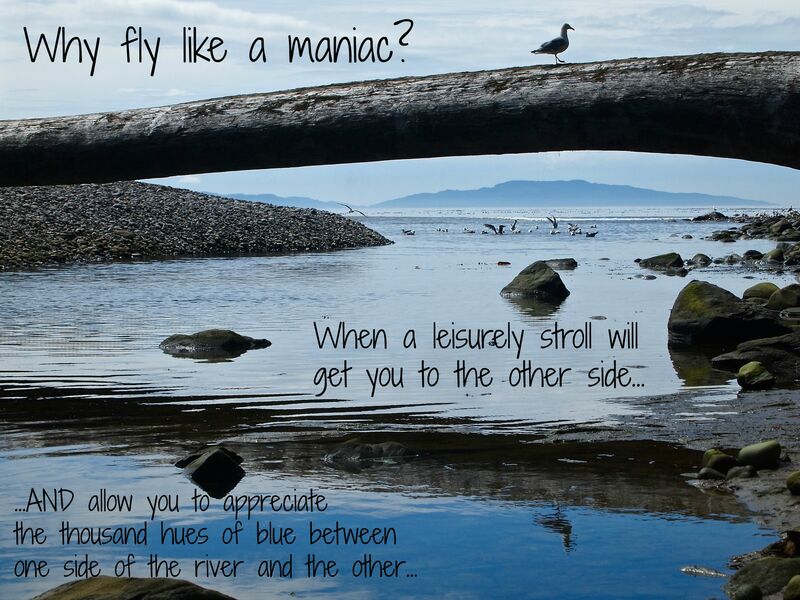 The course on Salt Spring Island is pretty cool – an easy stroll from downtown Ganges in a big park. 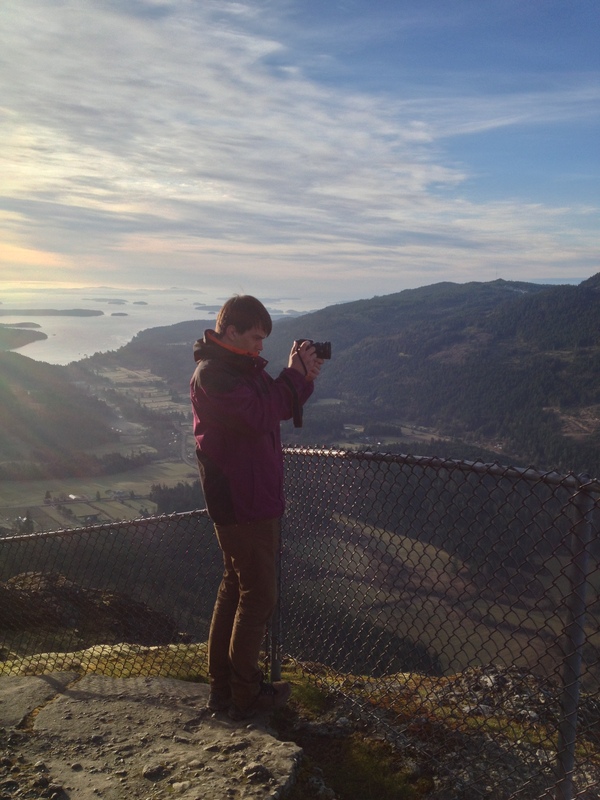 It was great visiting Salt Spring again and taking some time to poke around. 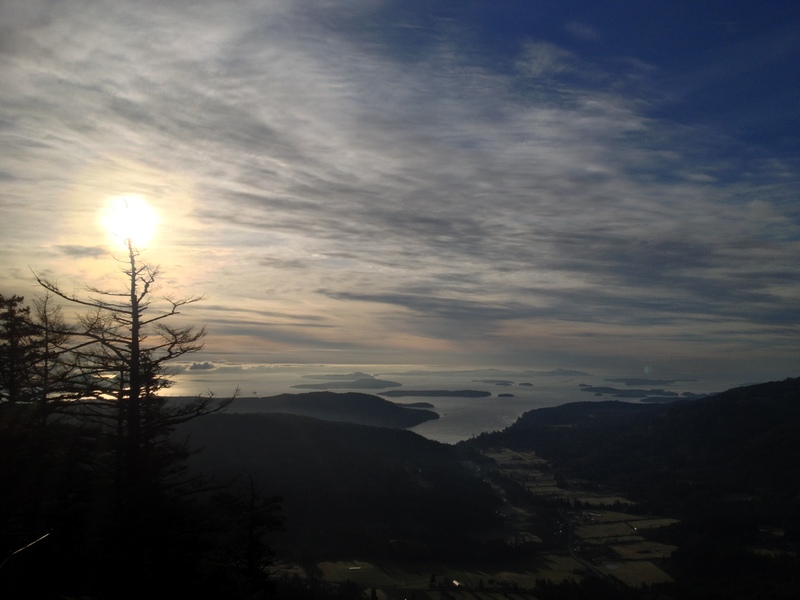 If I ever leave the ‘big’ island, I could imagine myself living on Salt Spring once again. For regular readers, there’s a connection to SSI in my books… I lived there in the early ’80’s and again a number of years later when my daughter was born at the Lady Minto Hospital. Those years on Salt Spring were great and when I was looking for a Gulf Island on which to model the fictitious Tarragon Island, I of course chose Salt Spring. Three books followed, two with Tarragon Island in the title, if you are curious and want to go searching. There is another planned and my recent trip reminded me why I set those books where I did. 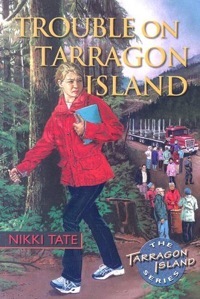 But, all that is the subject for another post… maybe T is for Tarragon Island?